It’s fortunate that somebody at Terminal Reality understands exactly what made the Ghostbusters films so entertaining. While the publishers are keen to play up the roles of Dan Aykroyd and Harold Ramis – who both contributed to the script and did the relevant voice acting – this is very much Terminal Reality’s take on the legend. 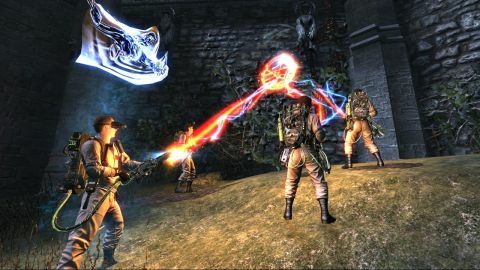 The game is told from your perspective as a rookie in the Ghostbusters team, in a story that follows on from the films. The Ghostbusters are, again, a kind of extra emergency service, taking out supernatural horrors across Manhattan. Unfortunately for them, Gozer is back, and this time he’s raising all kinds of cartoon nightmare manifestations across the city. Leaving in Ecto-1, you head out for some third-person ghost-capturing action, encountering unhappy hotel managers, petty bureaucrats, ghostly librarians and colossal Stay Puft apparitions along the way. Terminal Reality’s eye for detail is fantastic: marshmallow hellhounds explode with soft goo, elegant light-fittings tear themselves from hotel walls to become animated spider enemies. The strongest asset in the game is the fact that it gets the proton-pack beam weapons so right. You start out by softening up your targets with the first mode of the beam, and when they’ve been suitably battered you grab them with a gravity-gun mode, and drag them to the trap – which you or one of the team is able to deploy at any time. That’s one of the great things about this game: you’re rarely left to your own devices, and usually busting alongside Peter, Ray, Egon or Wilson, all voiced by the original actors. This makes for some splendid pitched battles, with you rushing around fighting ghosts while the team members pick each other up when they’re slimed, or stunned, or otherwise incapacitated by a spectral cast of screaming, flaming nasties. This provides you with a safety net. While you can fail a mission if everyone is knocked down, there’s usually a second chance to be saved from Game Over by a CPU-controlled Venkman or Spengler. There’s a lot of Ghostbusters lore and detail in here, and as your career progresses, your armory expands to include plenty of pack-based pseudo-science powers that weren’t featured in the films. You can also pump up your abilities by spending money to make proton-pack use even easier, and to make it less of a task to wrestle your foe into the trap. So there’s much to be said in favor of this game: it’s funny, approachable, and only has a few framerate issues on older graphics cards. That said, it’s also incredibly by-the-book. If you were going to make a Ghostbusters game in the exact tradition of both the films, and of movie-to-game licences generally, then you’d do it like this. The consequence is that this is a tightly linear game that depends wholly on the repeated use of the ghost-capturing sequence. This is initially a rather novel experience, which seems fresh and funny next to years of shoot-’til-dead action games built along the same lines, but it struggles to hold up the entire game. Thankfully some of the setpieces are spectacular – the Stay Puft giant on the side of a skyscraper, for example – and the dialogue is sharp enough for it to endure. While it’s hard to genuinely recommend a game that is as mechanically unambitious as this, it’s nevertheless bubbling with charm, and serves as a lively reminder of just how original and silly the original blockbusting film really was. Simultaneously a new Ghostbusters movie and an enjoyable videogame. Rough around the edges, but the superb scripting and unique humor make this a breath of fresh air.